This title was originally a non-mario title in Japan named Dream Factory: Doki Doki Panic that Nintendo bought the rights to modify and re-release in the US and Europe as SMB2. Some elements from the Mario universe already existed such as the Starman and the POW blocks. This is likely because top Nintendo designer and Mario creator Shigeru Miyamoto also worked on Doki Panic. Japan later saw the modified release under the title of Super Mario USA. Players choose from four characters each time they start or restart a level: Mario, Luigi, Princess Toadstool (aka Peach), and Toad. Each has a special ability: Luigi can jump very high, the Princess can remain temporarily suspended in the air (float), Toad can pick up things quickly and is very agile, and Mario is a balanced version of all these. A unique ability in this game is the "power squat", by holding Down on the control pad for a few seconds, players could build power for higher jumps. One of the game's most defining aspects is the ability to pluck vegetables from the ground which can be thrown to defeat enemies. Unlike other Mario games, simply jumping on enemies does not accomplish anything (barring the original mario bros arcade game, in which jumping on enemies accomplishes death). Most enemies may be picked up and thrown at other enemies. 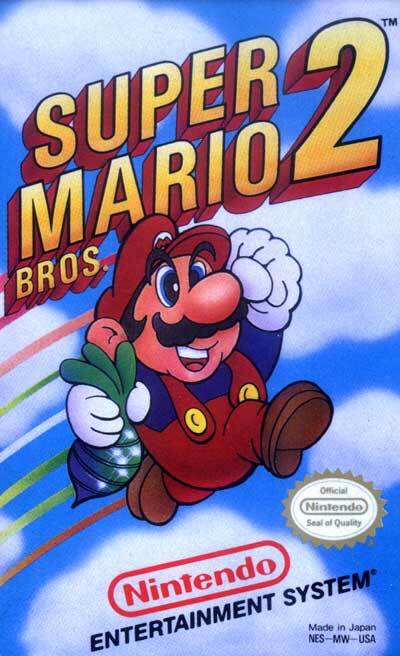 Regardless of differing gameplay features from the original SMB and all subsequent Super Mario titles, Super Mario Bros 2 as we know it in the US was a welcome addition to the Super Mario Bros series at the time of it's release here and is still considered a classic Mario title by many US players who were alive and involved in 1988. Newer generations may debate it's legitimacy as a genuine Mario game, but consider this... at the time, this was one of only two existing Super Mario games available to the US audience. As far as anyone was concerned, it was no more of a diversion than Zelda II or Castlevania II. None of these famous series were yet stylistically set in stone... virtually identical sequels were not yet being demanded by consumers. A far cry from the industry as we know it now. Only upon the release of Super Mario Bros 3 in 1990 (two years after this release) did the original Super Mario gameplay style as we all know and love it today become solidified as "the way it should be" in the US audience's view.